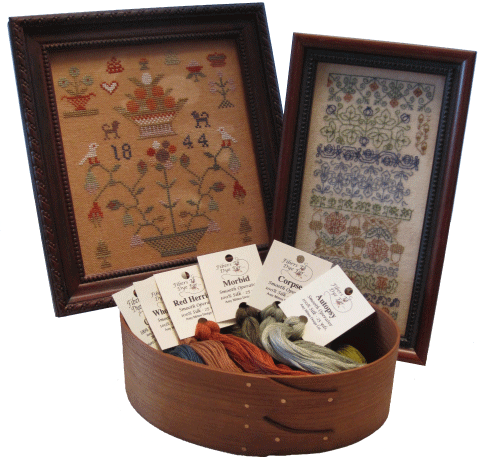 Welcome to Amy Mitten Designs, purveyor of fine needlework kits and supplies. My aim is to share my passion for needlework and history through workshops, online tutorials, instructional books, and original or reproduction needlework kits. All kits contain with the finest of materials, including my hand dyed ‘Fibers to Dye For’ silk thread. Instructions include traditional sewing techniques which enable you to create needlework pieces reminiscent of those from centuries past. Please enjoy browsing. If you wish to be notified when this website has new additions, please subscribe to my newsletter by Clicking Here. If you are browsing for a special friend and would like more information about personalized Gift Certificates for products on this website, please click HERE. To send your friends an email about this website, click on the envelope symbol below.